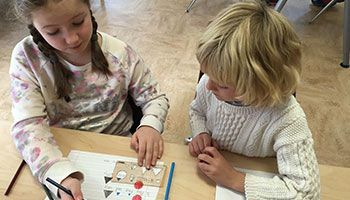 Consistent with Dr. Montessori’s philosophy, at OCMS children ages 6 to 9 (grades 1–3) work at their own pace in an environment that is collaborative rather than competitive. Children are provided with the tools and skills needed to pursue knowledge independently. In our carefully prepared classroom environment, uninterrupted blocks of time are allotted for students to use materials and assimilate concepts. During independent work, children often inspire and teach each other. Students are encouraged to explore areas of knowledge that interest them, which often leads to academic subjects usually not taught until middle school or high school. Our specially trained faculty guides each student and offers intellectual stimulation that will instill a lifelong love of learning through the foundation of a strong character and solid mind. The classroom environment is prepared in such a way that developmental, academic, and social growth progress naturally. Students stay in the same classroom and with the same teacher for a three-year cycle, which fosters a deep sense of community and caring for classmates, and allows the teacher to develop insights into the child’s personality that flow from an in-depth and trusting relationship. History of language as a window into the culture. Reading, leading to strong comprehension and interpretive reading skills. Writing, including basic research skills, and composition in a variety of genres, (reports, essays, poetry). Grammar studies including in depth work with the parts of speech and sentence analysis. Storytelling and oral presentation skills. Specially developed Montessori materials aid the students in their move to abstract thinking, and the development of the reasoning mind. Mastery of arithmetic is a primary focus which leads to work in linear measurement, time, fractions and percentage, ratio and proportion, squaring and cubing, powers of numbers, an introduction to algebra, and graphing. Geometry studies: including congruence similarity and equivalence, area of plane figures, and surface area and volume of solids. Solving word problems is a very important component of the mathematics work in the elementary classroom. At OCMS we encourage each child to see him or herself as a part of the universe. Our studies begin with the big bang theory, the eventual coming of life on earth, followed by the coming of human life on earth, and the special accomplishments of humans—written language and a system of numerals. Through a series of key lessons and demonstrations, the children develop a sense of awe and gratitude for all the work done by those who came before them. This gratitude leads to a child’s insatiable appetite for knowledge, and a wish to work hard and contribute to their own world. Additionally, students study the progress of civilizations both ancient and modern, cultural differences, art history, music theory and performance, and Latin. History is a natural part of the above studies, and is presented as part of many of the areas discussed above. An emphasis on U.S. history results as a natural progression from earlier studies.